Reflects the changing nature of community pharmacy practice with respect to responding to symptoms. This is a guide to the disease symptoms frequently encountered in community practice, and can be used to aid the pharmacist in making a rational diagnosis of illness and a recommendation for treatment or referral. Diagnosing and treating minor ailments has become widely recognised as being an important part of the pharmacy profession. 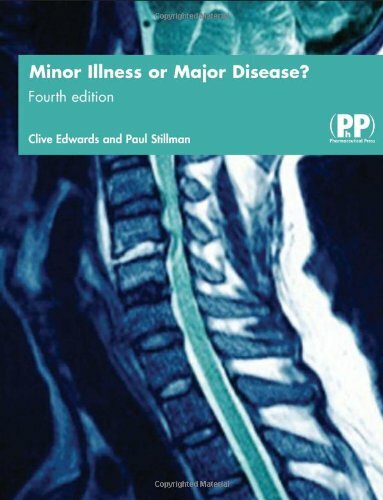 "Minor Illness or Major Disease?" is a clear, concise guide to the disease symptoms frequently encountered in community practice, and can be used to aid the pharmacist in making a rational diagnosis of illness and a recommendation for treatment or referral. This new edition has been completely revised and updated to reflect the changing nature of community pharmacy practice with respect to responding to symptoms. Updates include details of new prescription only medicines being deregulated to pharmacy medicine status, advice on commonly used herbal OTC medicines such as Echinacea, St John's wort, and glucosamine, evidence for use of OTC medicines, and even more helpful illustrations. It offers key further reading and updated case studies presented in a Q and A format accompany each chapter.